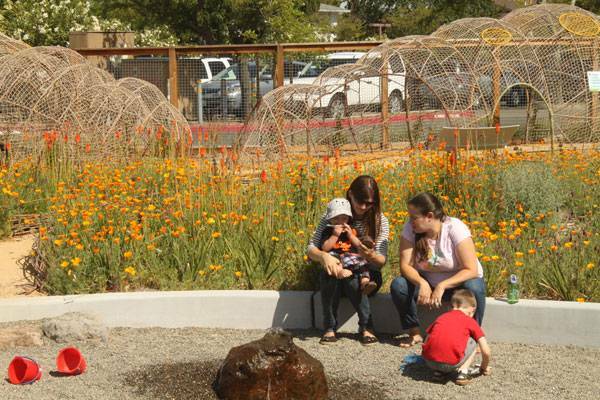 Article by Elisa A.M.Varetti Mary’s Garden, Children’s Museum of Sonoma County, by BASE Landscape Architecture, Santa Rosa, California, United States of America. Being a landscape architect can be extremely funny sometimes, especially when you are asked to design a child-oriented outdoor museum. Be careful; it doesn’t mean it’ll be an easy task, not at all. There are indeed different things to take care of, as our writer Velislava Valcheva reminds us in her article, 11 Things to Remember When Designing for Children. 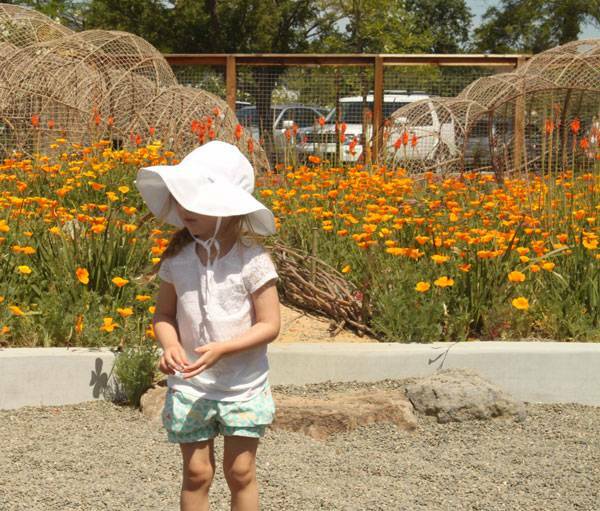 The Children’s Museum of Sonoma County by BASE Landscape, in Santa Rosa, California, is a rare example of a child-oriented design process in which kids satisfy their thirst for knowledge by having real fun. Thanks to a grant of $1.8 million given by the state of California’s Office of Grants and Local Services, it has progressed from being a “Museum-On-The-Go” into a proper museum. 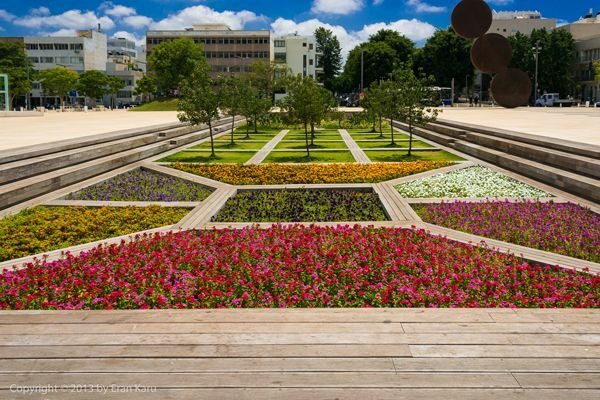 Its oudoor area, titled Mary’s Garden, has been the first phase of the project to be realized. 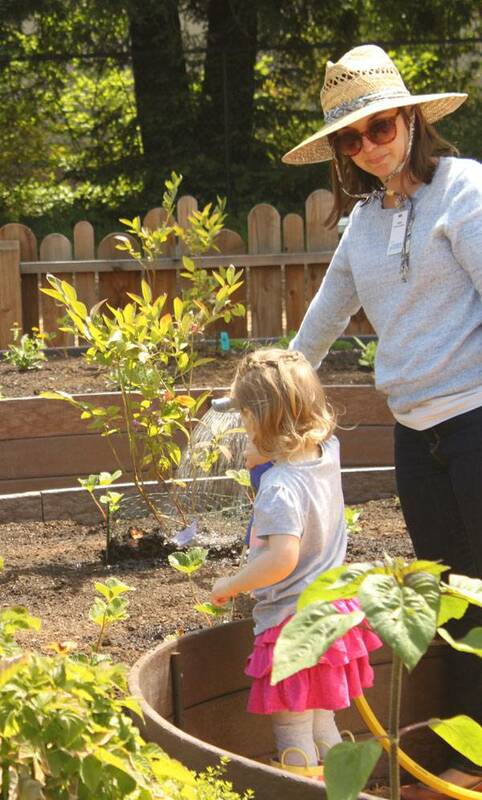 This outdoor area, designed to become a children’s garden of learning and play, has been the first part of the whole museum to be developed because “It was essential to the Museum’s long-term success and mission”, says Collette Michaud, CEO of the Children’s Museum of Sonoma County. 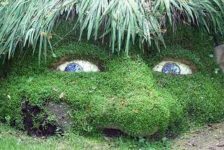 The concept of Mary’s Garden was to reunite children with nature by creating an interactive area with a tantalizing design capable of stimulating childrens’ imagination. 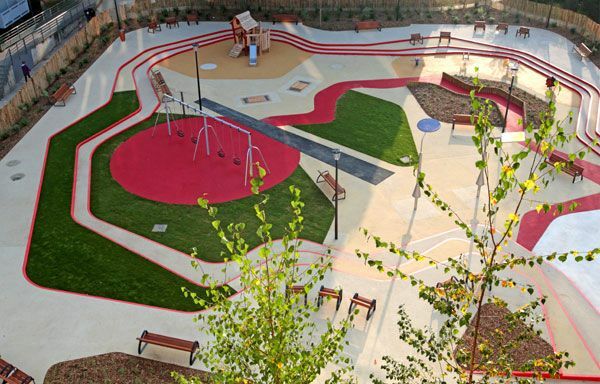 With this thought in mind, Andreas Stavropouloud and Patricia Algara of BASE Landscape Architecture managed to design a plan capable of inspiring children’s creativity and satisfying their curiosity to discover the world; “It gives a lot of room for creativity”, they say. 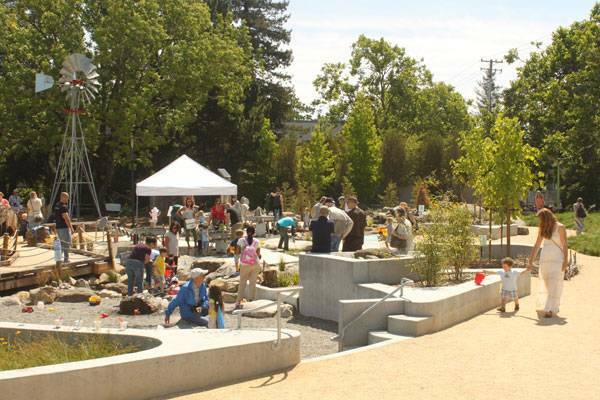 The whole design has been inspired by a transect of the environments of Sonoma County. By studying them, BASE Landscape developed a place where it is possible to pass, in a short walking distance, from inland agricultural valleys all the way to the Pacific Ocean. This became a main feature of the project because it was important to connect children with their local territory and make them aware of their surrounding landscapes. 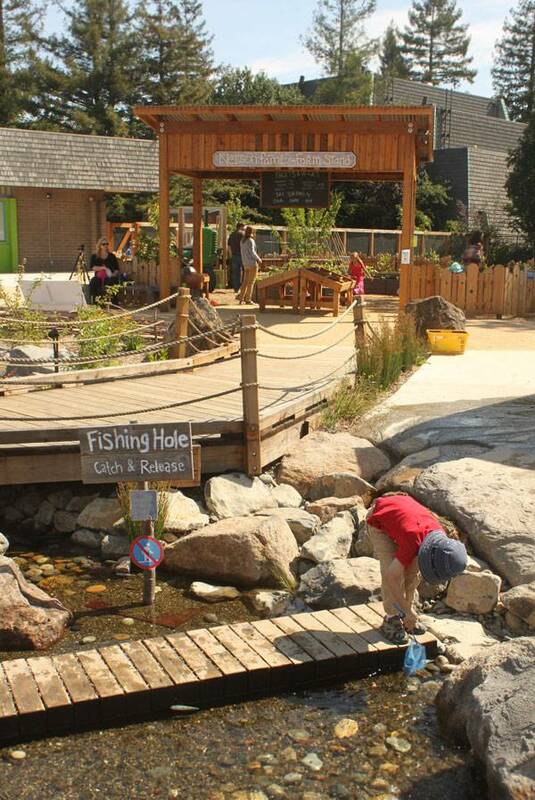 There are, of course, other examples in which designers try to reunite children with nature, as Dalia Zein reports us in her article Exceptional Ecological Park Reconnects Children With Nature. 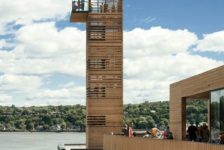 The project focuses also on the main river of the country, the Russian river, which is here represented with a water feature which begins its headwater in the hill, passes through gravel beds and marshes along the way, and flows through the site to the beach. 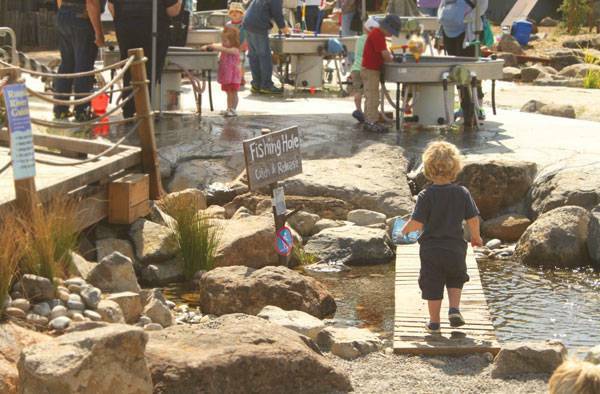 In order to achieve these three educational goals, BASE Landscape developed exhibits that introduce children to everything from solar power and crank mechanics to water tables. 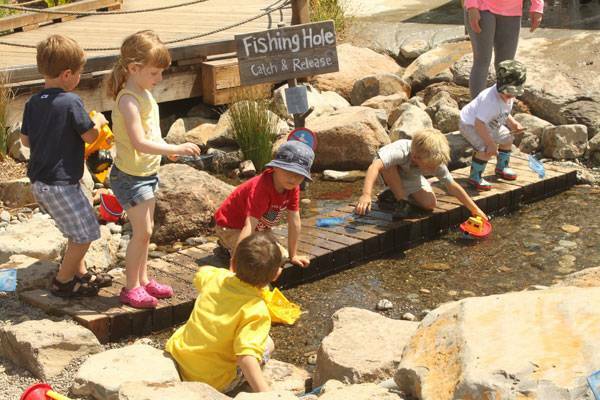 By playing in these areas kids will learn new and important things about nature, science, and our planet, and will start to think about sustainable environmental living practices. One of the educational sides of the garden is getting kids to learn about pollinators and their importance for our planet. 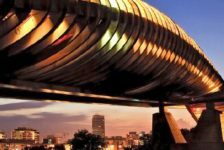 The title of the area, Mary’s Garden, is a tribute to those beautiful insects, as “Mary” comes from Mariposa (in Spanish; butterfly) and the moniker refers to the birth and life of a swallowtail butterfly whose name is Mary. Here kids will also understand the mysteries of metamorphosis thanks to a series of different but amazing elements representing bright eggs to climb and to hide in, and caterpillars in steel armature covered by netting and flowering vines to walk on, and also kinetic butterflies that flap their wings when kids crank the handle. 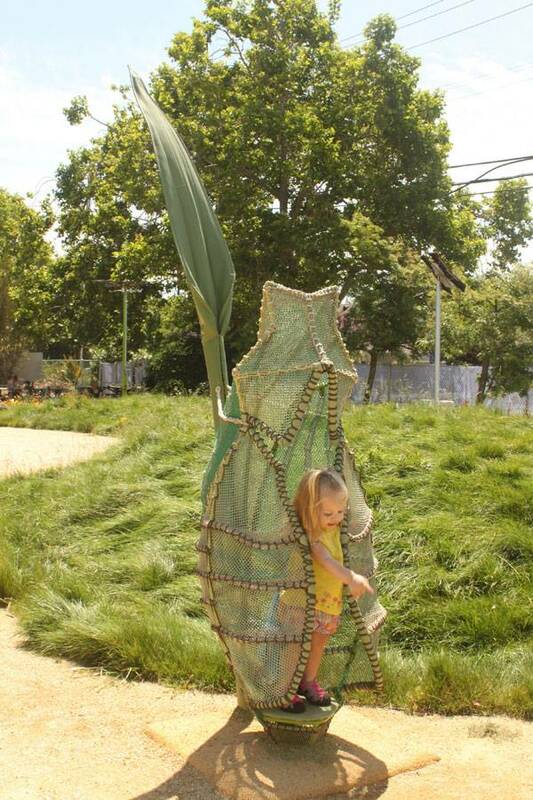 Children will also discover large-scale solar and wind-powered butterflies placed throughout the garden. 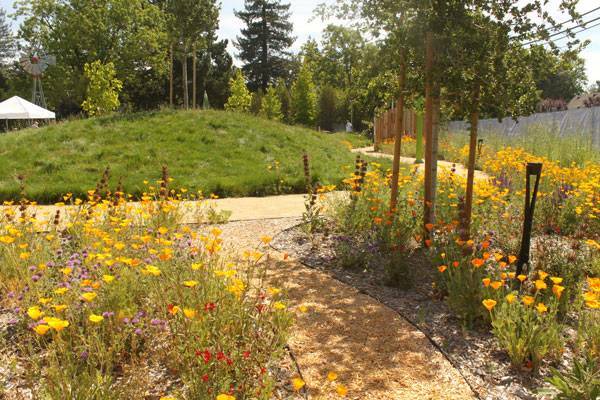 Apart from its design that relates to the Russian River, the garden also develops educational aims around the issue of water. Here, in what it is called the mechanical water play area, kids can learn how human beings use water in many different ways. They learn how water gets pumped, stored, and diverted; they discover how Archimedes’ screws and dams move water through agricultural areas and generate hydropower. They also can experiment with using hand pumps. 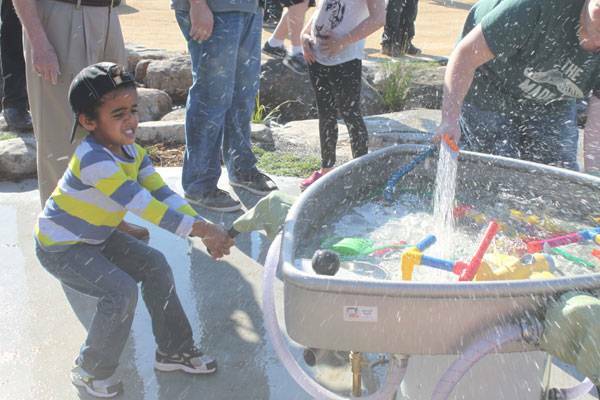 In the same way as in real life, water is pumped from the river to the mechanical water play area; in this way kids get to know and understand the importance of water for us and our planet. 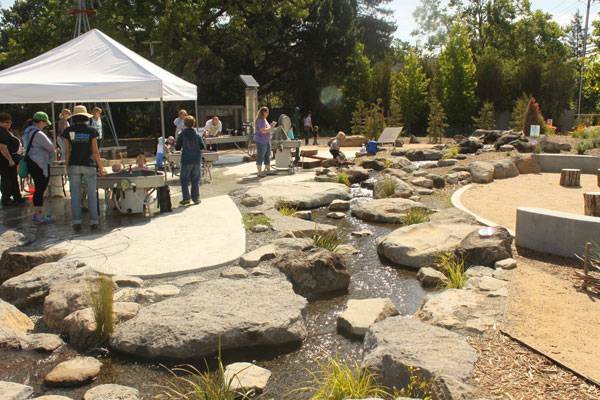 One of the most interesting parts of Mary’s Garden is, of course, is its water play area which represents the first naturally filtered children’s water play area in Northern California. As the designers say; “Water is first cleansed via vegetative material and a gravel filter in a living wetland, then passes through a UV filter before being recirculated.” The Sonoma County Department of Health Services Director itself approved the permit for the natural filtration system. 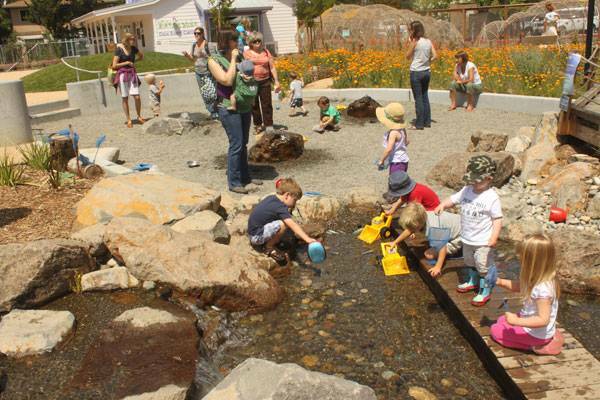 Thanks to a chemical-free system, children can safely play with the water and get wet without any health risks. In addition, all the wetland plants are able to thrive. 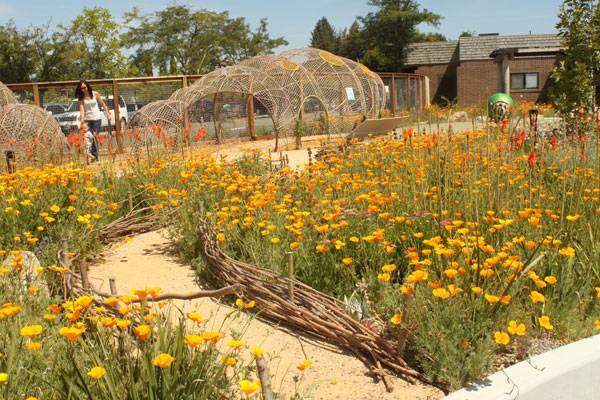 The marsh is composed of pesticide-free native and adapted plants which have been grown by a local nursery. Everyone knows that nowadays most of the children aren’t aware of where our food comes from or even what some animals look like. It’s not their fault, of course, but living in a metropolis, far from the countryside, doesn’t help in keeping contact with the natural world. 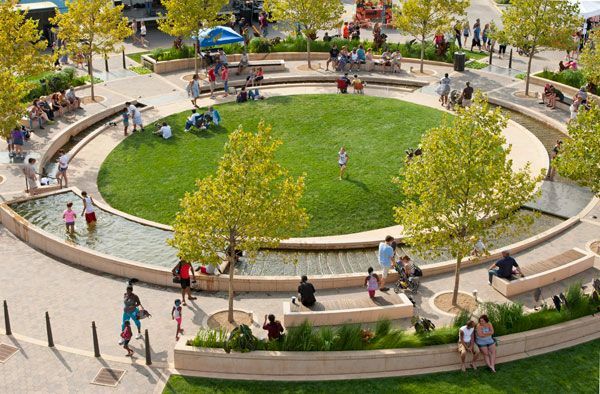 That is why it is so important that when it comes to designing something for children we must remember that kids represent the future, as Erin Tharp clearly states in her article Why Designing for Children is Vital to The Future of Landscape Architecture. 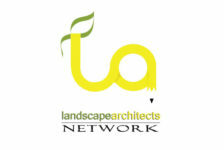 Featured in our article Why Designing for Children is Vital to The Future of Landscape Architecture. Uptown Normal. Photo Credit Scott Shigley – Hoerr Schaudt. Even if Mary’s Garden is not a playground, but a childrens’ museum, its amazing details, nature-inspired design, innovative water features and technical details can definitely let it be considered as one of the most interesting playgrounds of recent years, like the ones which our writer Amela Djurakovac talks about in her The 10 Best Playgrounds of the World. 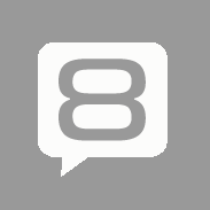 Can Rivers Provide Useful Transportation Routes in the 21st Century?